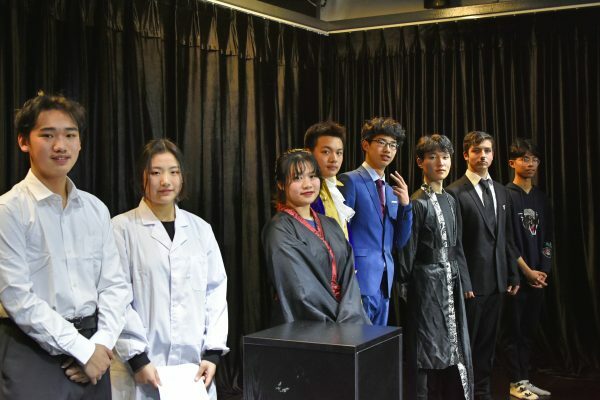 Grade 10 students recently wrote and performed their own short scene as part of their IB Pre-Diploma Drama course. Students reflected on important celebrities or historical figures and wrote a monologue about an important time for their character. The audience was entertained by a variety of performances, from Florence Nightingale, to Heath Ledger, to Genghis Khan. For some students this was their first time speaking in public. For some students who are new to NBHIS, it was their first time speaking publicly in English, having only been studying at the school for a few months. All students were courageous, confident and expressive performers. Not only did the students communicate their characters’ passions with credibility and authenticity, they also wrote their own scripts. This was a particularly impressive task as a successful performance is only as good as the written material. Writing the monologues was a part of the assignment and provided students with an opportunity to explore in depth the characteristics of this text form. The monologues were great representations of the determination, persistence and creativity NBHIS students applied to this challenging task. Students reflected on what they had learned from this process. I really enjoyed acting as Adolf Hitler since it challenged me to preform in an emotion that I don’t feel that often. I was very focused on the day of the performance to make sure I remembered my character’s emotions from my emotional memory. After the performance I felt quite shocked since I just used a range of different emotions. Overall, I really enjoyed this unit and wish I could do it again in the future. I think it’s incredible. Because when I said “Stand up” all of the audiences were standing. Although the I made a mistake, it’s also successful. Before I was performing, I was worried about whether I could play this role, but I felt that after my performance, I performed very well, my courage increased and I could smoothly integrate into the role, I also watched It’s also good to have the students perform. I felt really interesting and new to do the monologue in front of a lot of people. To act like Nightingale is not because I want to be the nurse, the reason that she is really attracted to me is I think her experiences and courage is really cool. I think my acting is flexible and I don’t act very much. I act Heath Ledger because he is my idol. When I was performing, I feel little bit nervous but I do enjoy that, and like doing the performance.